Compact room but had everything needed, comfy bed, and towels and shower gel were provided. Close to the airport. Good parking. Nice reception staff. It is a beautifully art deco appointed B&B, very close to the airpot but far enough that it is not bothersome. There are a umber of restaurants an nice pubs close by. The owner is very friendly and helpful. They have a transfer service to Gatwick that is very handy! Great for staying at the airport with direct access to the North Terminal and access to the South Terminal via the Shuttle. Overall - Very Good. Fantastic welcome; very helpful reception team. A stress-free stay - perfect. This property was conveniently located near the Thameslink into London. Also easily accessible to the Gatwick airport. Friendly staff and very clean. Rooms are quite small but the beds were really comfortable. Location excellent for bus/taxi to airport and local pubs and restaurants. Excellent, albeit a little expensive, full English breakfast. The room was clean and comfortable and the service good. Excellent access to North terminal at Gatwick airport and very easy access to South as well. Hotel was clean, well run and very conveniently placed for a flight out of (or into) Gatwick airport. Extremely convenient if you are flying at gatwick airport, hotel is right at the north terminal, direct train from hotel to south terminal, highly recommended if you are flying at gatwick airport. We were over-nighting in Gatwick and found this Hampton Inn to be very convenient, quiet, and clean. 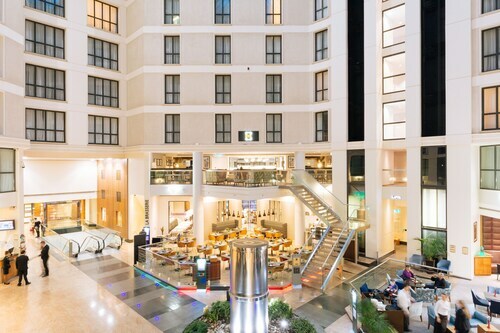 Let us check in early when we arrivedThis hotel is very convenient when traveling from or into Gatwick Airport. Staying the night right at Gatwick worked perfectly for our small group travelling back to Canada, I would and have recommend using this hotel. It might not have the same name appeal as Heathrow, but Gatwick Airport (LGW) has its own set of charm. If you’re flying through this small airport and want to stay in town a while, you’re in luck. This quaint neighbourhood offers everything you need to unwind and get a feel of the English countryside. Bring along your walking shoes when you travel through Gatwick, as this area is surrounded by natural wonders. For starters, don’t miss the Sussex Gardens. The 20th century gardens hang low from archways next to beautiful stone buildings. It’s the perfect place to stretch your legs if you’ve been cramped in coach for a long flight. You may also want to head 3 km west to the Hannah Peschar Sculpture. It’s an odd juxtaposition of a bronze figure resting amongst the vegetation, and it provides some prime photo opportunities. Want to be around people instead of plants? No worries. Head into Crawlet, the closest small town to the airport. This spot features local boutiques as well as a bowling alley, movie theatre, and a number of restaurants ready to serve you some traditional Shepard’s Pie. Have some left-over munchies? Bring them with you to your Gatwick hotel. Book your hotel in London right here on Expedia.ca so you can find accommodations with all the amenities you crave, like spots with an in-room refrigerator and microwave. You may even want to pick a hotel close to the parks in town for a good walk in the country before heading deeper into the city of London. Whether you’re looking for a full stay around Gatwick or you’d like to do a day trip around the area, allow Expedia.ca to help you with your accommodations. What are the most popular Gatwick hotels? 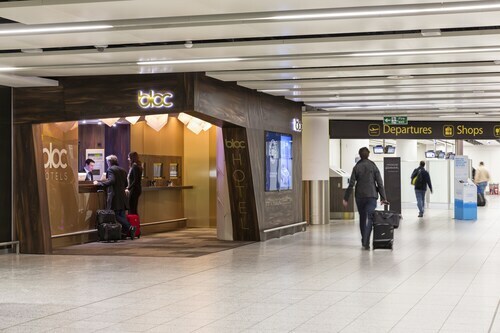 What are the other airports around Gatwick with nearby hotel options?